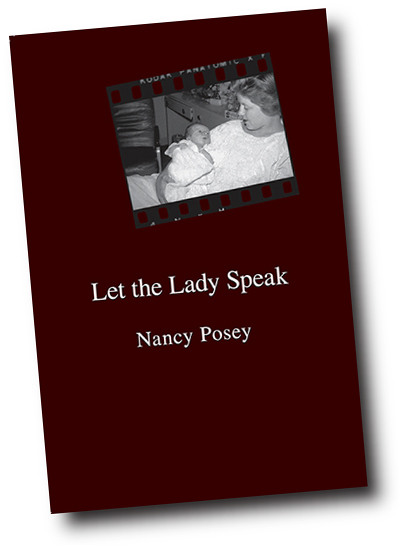 Nancy Posey's Let the Lady Speak is a chapbook from Highland Creek Books. As the eldest of five daughters, the third in five generations of first-born daughters, I was never discouraged from finding my voice or speaking my mind. This particular group of poems came together as I imagined not only what my grandmothers and great grandmothers might have to say, but other women in history and literature as well. I am most fortunate, too, that I do not have to imagine my own mother’s soft-spoken voice. I just have to stop and listen. A voracious reader, I worked my way through the biographies during some of my years in elementary, while I have found many of my fictional characters just as real. Always interested in considering the other point of view, therefore, I was just as curious about what Lady Macbeth or Scarlet O’Hara might have to say as Amelia Earhart or Anne Frank. I have a button pinned on the board beside my computer desk that reads “I’m a Good Listener!” Some days, if I listen closely, I hear some of those voices — the fictional, the historical — mingled with the voices from my own family. I pay homage by paying attention. Ask, and she'll probably autograph it for you into the bargain. Let the Lady Speak is also available from Amazon.